Homero Toral-Cruz received Ph.D. and M.S. degrees in Electrical Engineering, Telecommunication option from Center for Research and Advanced Studies of the National Polytechnic Institute (CINVESTAV), Jalisco, Mexico, in 2010 and 2006, respectively. He received the B.Sc. degree in Electronic Engineering from "Instituto Tecnológico de la Laguna", Coahuila, Mexico in 2002. 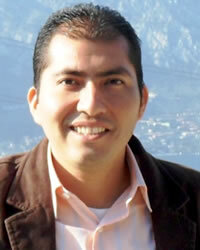 He is currently an Assistant Professor at Sciences and Engineering department in University of Quintana Roo, Mexico. Prior to holding this position, he served as an Assistant Research at Electrical Engineering department, Telecommunication section in CINVESTAV, Jalisco, Mexico and he worked as a Professor at Electronic Engineering department in "Instituto Tecnológico Superior de Las Choapas”, Veracruz, Mexico. His research interest includes VoIP technologies, QoS and network measurements, convergent networks, Internet technologies, IP traffic modeling, network performance evaluation, network security and WSN. He has served as guest editor of some international journals of Springer-Verlag, Hindawi and Inderscience. In addition, he has served as a Technical Program Committee member of some international conferences and workshops. Dr. Toral is also an active reviewer of some renowned international journals. Furthermore, he has been awarded a national recognition as a researcher (SNI level 1) by CONACYT and has been elected as member of the Mexican Academy of Sciences (AMC) and member of the Networking and Distributed Computing Laboratory (NDC) by Kulliyyah of Information and Communication Technology (KICT), International Islamic University Malaysia (IIUM).